Since adopting Winston 6 months ago from PUP he has fit right into our lives. He goes with me to work at Amazon every day and greets everyone with a friendly face and a tail wag. In addition to making friends at work he has also made friends at doggy day care and at various retirement homes where we visit residents who miss their dogs. He has already become quite the traveler and came with us on a trip to Las Vegas in May. He flew like a champion and everyone at the airport wanted to meet and pet him. As usual he was friendly to all. I think the heat was a nice break for him since he gets chilled easily in Seattle! We had lots of fun hiking around Lake Mead. 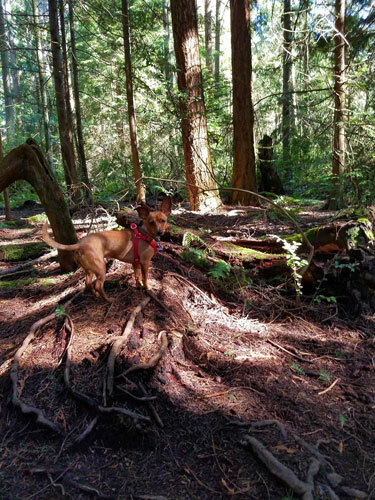 I think our favorite local trip so far has been to Whidbey island's dog park where we had fun walking with him in their forested off-leash area. Every day we are thankful to the foster family that made adopting him possible. He was a perfect little gentleman on arrival thanks to their care and the things they taught him help us every day when we say "do your business" or "up up" to go up the stairs to our apartment. Any time we see a child he is excited to go see them and I think it is because the young boy of the family was kind to him and taught him that children are nice and friendly. My husband has "tricks for treats" time with Winston every day so in addition to all of the tricks he already knew he has learned to lie down, roll over, shake (with both paws), sit pretty (put both paws in our hand), high five, and to run around in a circle. 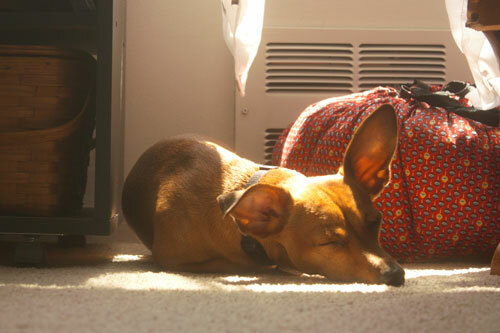 I attached a couple of photos of him--one at Whidbey island and another of him sunning himself under one of our windows. Thank you so much for everything you do for dogs like Winston.